More than often there is lack of motivation or only a short-lived one. How many times have you started enthusiastically a weight loss program, began a bodybuilding or aerobics training program or started to learn a foreign language, only to stop after a short while? Few people possess enough willpower and self-discipline to go through to the end with what they begin. 3. Think often about your goal or desire. 4. Visualize your goal as already accomplished, and close your mind to contrary thoughts. 5. Read books or articles about the subject of your goal. 6. Read about people who have achieved success. 7. Think often about the benefits you will gain by achieving your goal. 8. Visualize, and think about how you would feel after achieving your goal. 9. Repeat positive affirmations such as: "I have the desire and inner strength to achieve my goal". Repeat this affirmation often, with faith and strong feelings. 10. Start with doing something small concerning your goal. Success in small matters leads to greater success. Develop and maintain a positive attitude with life as well as an open mind to new ideas about health and nutrition. Focus on what you need to do to be healthy, not the reasons why you cannot be healthy. What you focus on will be what defines you and your journey – so focus on the positive, not the negative. Establish relationships with positive people full of hope, and healthy people who have either beat their diabetes or are controlling it with nutrition and exercise. Look for what you love about your family members and friends instead of what’s wrong with them. Acknowledge these positive perspectives to each of them individually and together. Keep in mind that discord with family members and friends can create stress. Also, starting out on this new journey may threaten some relationships that are founded on co-dependency. Some of their resistance to your changes may be due to their concern that they may lose your friendship. Assure them that that is not the case. But also assure them that you will not allow them to deter you from your new journey. Try to find a partner or friend who will work with you and support you on your journey. Do you hate Brussel sprouts or broccoli? Then, for a whole week, eat Brussel sprouts for breakfast and dinner. Then, for the next week, eat broccoli for breakfast. If for the sake of an exercise, you stop doing something that you usually do, and overcome the inner resistance concerning it, you may resume doing it, if it is not harmful. For example, if you love drinking orange juice, and for the sake of an exercise you switch to drinking apple juice, after doing so for some time and after it makes no great difference to you, you may go back to drinking orange juice, if you still like it. The point here is to develop inner strength, not making life difficult for you or continue doing things you don't like to do. With television, computers, e-mail, radio, mobile phones, video, iPods, newspapers, magazines, etc there has never been an easier way to reach our minds through advertising. A lot of us don’t realize that we are all being manipulated in some way to do things that may be harmful to us. I am not talking conspiracy or anything like that, it’s been a natural progression. Advertisers have become a lot smarter and appealed to our psyche rather than our rational minds, there are some great adverts out there which slip into our minds and build up and eventually get us to act to buy something or do something. That's the Number 1 question that we are asked every year. And, every year, we tell our students and diabetic clients the same thing: Whether you get the flu shot or not is a personal choice. And, that personal choice should be based on an understanding of the immune system and how the flu shot actually affects your immune system. Unfortunately, what we have discovered over the past several years is that most people really don't understand how their immune system works and how the flu vaccine affects their immune system. As a result, most people choose (or not choose) to get the flu shot for the wrong reasons. FYI: Science actually shows us how the flu virus is structured, how it works, and, how it mutates. Based on that, it's almost impossible for the flu vaccine to be manufactured with the right viral strain! In fact, the CDC confirms that the flu vaccine is mostly ineffective due to the flu virus's mutating capability. 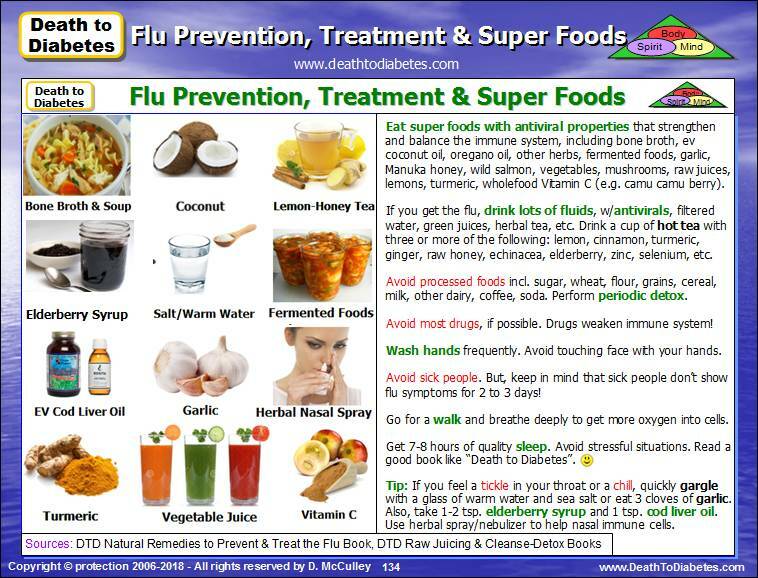 And, even if you should get the flu, there is no need to panic -- we will show you how to shorten the duration and lessen the severity of the virus. Then, and only then, will you be able to make an informed decision about whether you and your family members should get the flu vaccine. We'll get into this in more detail shortly, but, in a nutshell, you must STRENGTHEN your immune system. Whether you get the flu shot or not is a mute point. Either way, you still have to strengthen your immune system. I know that I sound like a broken record, but, this cannot be emphasized enough. A bunch of drugs, antibiotics, pain relievers, fever reducers, vaccines, steroids, antivirals, aspirins, etc. aren't going to help you! In fact, too many of the wrong drugs will actually weaken your immune system and make matters worse! The CDC and the medical industry recommend that you get the flu vaccine and take various medications to fight the flu. The CDC and most medical doctors believe that people with diabetes should get the flu shot because they have weakened immune systems. Despite evidence to the contrary, the CDC and the pharmaceutical/medical industries truly believe this so much that they continue to increase their advertising and marketing campaigns to encourage more and more people to get the flu shot -- including babies!, children, pregnant women, people with egg allergies!, diabetics, and senior people. Before I get into flu prevention, natural remedies and the top 10 super foods for strengthening the immune system and killing the flu, I thought that I would share with you what's been happening in our training classes during the past several years concerning the flu vaccine controversy. Several years ago, four smaller companies and groups within those companies had gotten together to hold an internal company health fair event. During that time, most of these companies had funded us and several other health groups and insurance companies to come in and speak about healthcare, diabetes, and the flu -- usually during the September to early December timeframe. About 4 years later, each of these companies had noticed a tremendous decrease in their employee absences and improvements in their health, based on their employees' medical reports. They also noticed that absences and hospital visits during the flu season had gone to almost zero, which was unheard of for people with diabetes. There was also an improvement with non-diabetics who had attended our classes. Years earlier, many of our students and diabetic clients had started out getting the flu vaccine. But, each year some of our students and diabetic clients who got the flu shot were having adverse reactions or got the flu. However, most of the students and diabetic clients who didn't get the flu vaccine did not catch the flu. So, here we are, several years later ... The reps from some of the healthcare companies, insurance companies, and some of the medical people have admitted to me that they are amazed and impressed that people are doing so well without getting the flu shot! They admitted to me that they thought I got lucky during the first couple years. They didn't expect the good fortune of the employees' health would last this long. Ironically, some of the medical personnel ended up getting the flu and decided later to sign up for some of our classes during the past three years. Now, some of them are trying to avoid getting the flu shot. But, some of them told me that they may have to get the flu shot to keep their job! What?? :-O Is this still America?? Needless to say, the medical and healthcare personnel learned a lot about the immune system and how the flu vaccine actually affects the immune system at the cellular level. Now that they know how the flu vaccine actually affects the immune system (and other systems), some of them admitted to me that they don't know what to do without risking their own jobs. (I believe that I have a solution for all of this -- a win-win for everyone -- more about that later). But, I must admit that some of them were really angry with me and wouldn't accept what I was telling them even though they agreed with my explanation of the science behind the pathophysiology and pathogenesis of the flu virus at the cellular level. (I'll discuss that in more detail in a future post for those of you who just love science :-)). 𝗦𝗶𝗱𝗲𝗯𝗮𝗿: I was really surprised with the amount of anger and frustration among family members and friends about the flu vaccine. Interestingly, both sides were using points of view that had nothing to do with science! They thought their points of view were based on science but it was information that they had learned over the years from TV, their doctors, newspapers, the Internet, etc. I've also seen the same thing on social media. But, it's worse there because misinformation spreads just a like a virus (pun intended). I've noticed the anger and frustration has escalated into rudeness and personal attacks in this negatively-charged environment that we live in -- primarily, due to people's ignorance, fear, ego, envy and hidden agendas. Ironically, if you're diabetic, this anger and frustration will only raise your blood glucose and worsen your health! Why should this be of any importance to you? Because the flu vaccine bypasses the natural innate immunity system (yellow box), which has the cells that kill the virus! Look at the cells in the yellow box -- most of those cells are killers. The flu vaccine triggers the antibody-mediated immunity system (blue box), which produces antibodies and provides a strong Th2 antibody immune response. But, it also provides a WEAK Th1 cellular immune response. This strong Th2 response in combination with a weak Th1 response creates an imbalance that prevents the Th1 system from killing the virus. Oh, by the way, a strong Th1 immune response would give us close to permanent immunity without the side effects of allergies, asthma, eczema, etc. Plus, there would be no need to have to get a flu shot every year anymore! :-O Your innate immune system will activate the antibody portion (blue box) of your immune system to produce the necessary antibodies. 𝗣𝗢𝗜𝗡𝗧 𝟮 [𝗜𝗡𝗡𝗔𝗧𝗘 𝗜𝗠𝗠𝗨𝗡𝗜𝗧𝗬]: Under normal circumstances, a virus (or any pathogen) enters the body via the eyes, nose or mouth -- not through your arm and bloodstream like the flu vaccine. When the virus enters your nose, the epithelial cells in the nasal passageways release cytokines (signals), which activate immune cells in the Innate Immune System. These immune cells include macrophages, which eat and digest the pathogens via a process called phagocytosis; and, natural killer (NK) cells, which inject an enzyme into the virus to break it down and kill it via a process called lysis. 𝗣𝗢𝗜𝗡𝗧 𝟯𝗮 [𝗙𝗟𝗨 𝗦𝗛𝗢𝗧 𝗘𝗙𝗙𝗘𝗖𝗧𝗜𝗩𝗘𝗡𝗘𝗦𝗦]: However, since the flu shot is injected directly into the bloodstream, it bypasses the Innate Immune System's first line of defense and the cell-mediated portion of the Adaptive Immune System. In other words, the flu shot initially bypasses almost two-thirds of the immune system! This prevents the Innate Immune System from "learning" about the viruses and building a natural immune response. The flu vaccine uses adjuvants, which are substances that are added to a vaccine to increase the body's immune response to the vaccine. These adjuvants create a strong Th2 immune response, which produces the antibodies to fight the virus. However, the adjuvants create a WEAK Th1 response, which limits the activation of the immune cells that eat and kill the virus, e.g. macrophages, natural killer (NK) cells, cytotoxic T killers, etc. Even the CDC is in agreement with this and why the flu vaccine is so ineffective most years. So, why is the vaccine designed this way? It was partially due to ignorance. The virologists and scientists didn't really understand the structure of the immune system back then. 𝗣𝗢𝗜𝗡𝗧 𝟯c [𝗙𝗟𝗨 𝗦𝗛𝗢𝗧 𝗘𝗙𝗙𝗘𝗖𝗧𝗜𝗩𝗘𝗡𝗘𝗦𝗦]: Just to be clear about those percentages from the CDC, that percentage of effectiveness does not mean it's the percentage of effectiveness against getting the flu. It does not mean that 47% of the people who got the flu vaccine didn't catch the flu. It means that 47% of the people who got the flu vaccine were successful in creating antibodies, based on the strain mix in the vaccine! According to the latest report from the CDC about the 2017 flu vaccine, the flu virus is widespread across the United States: "Flu is everywhere in the US right now," said Dr. Dan Jernigan, director of the CDC's influenza branch. "This is the first year we've had the entire continental US at the same level (of flu activity) at the same time." It has been an early flu season that seems to be peaking now, he said, with a 5.8% increase in laboratory-confirmed cases this week over last. As of January 2018, this year's flu virus is affecting an increasing number of people nationwide with reports of multiple strains of H1N1 and especially H3N2. This is another indication of the ineffectiveness of the flu vaccine. 𝗣𝗢𝗜𝗡𝗧 𝟰 [𝗙𝗟𝗨 𝗦𝗛𝗢𝗧 𝗜𝗡𝗚𝗥𝗘𝗗𝗜𝗘𝗡𝗧𝗦]: Some of the ingredients in the flu vaccine have been identified as toxins that may be harmful to one's health. Besides the flu strains, these ingredients include thimerosal (mercury compound), formaldehyde, aluminum salts, chicken egg proteins, antibiotics, and detergent. 𝗤𝘂𝗲𝘀𝘁𝗶𝗼𝗻: OK, let's assume that the amounts of these toxins are too small to harm us. Let me ask you a simple question: Would you swallow a ½ drop of arsenic since the amount is too small to harm your body? 𝗣𝗢𝗜𝗡𝗧 𝟱𝗰 [𝗙𝗟𝗨 𝗦𝗛𝗢𝗧 𝗦𝗜𝗗𝗘 𝗘𝗙𝗙𝗘𝗖𝗧𝗦]: Several years ago, some of our other students and diabetic clients told us that they got the flu shot to protect other family members. But, it didn't work -- family members ended up with the flu, but, their doctors didn't know why. Also, some of the students who got the flu shot one year and didn't the next year thought that the flu shot would still work the next year because it worked the previous year. They didn't realize it was their immune system that saved them, not the flu shot from the previous year! These are just a couple of the many examples demonstrating why people need to understand how the immune system works! When a family member gets the flu shot, it doesn't protect other family members! In fact, most people who get the flu shot may actually be contagious for 1 to 2 days! And, if you don't get the flu, it's your immune system that protected you, not the flu shot! These stories are disheartening because there is no need for people to die just because they don't have the right information! How can we help people? Any constructive suggestions? My areas of expertise are engineering and science, so I tend to stay away from any legal issues associated with the healthcare industry. As an engineer, I don't believe that you can draw a direct causal relationship between the increase in vaccine-related lawsuits and vaccines being the root cause. Ok, so what does all that science mumbo-jumbo mean to you? :-) Well, it means that the scientists are unable to predict the right strain to put in the vaccine because the flu virus continues to mutate! As a result, according to the CDC, the flu is only successful 10% to 47% of the time! To make matters worse, the adjuvants in the flu vaccine create a strong Th2 antibody immune response but a weak Th1 cell immune response. That means that there are a lot of antibodies to "tag" the virus, but, there aren't enough killer cells to destroy the viruses, making people (who lack these killer cells) more susceptible to the flu and pneumonia! So, what are you to do? Bottom-line, whether you get the flu vaccine or not, you MUST strengthen your immune system and your overall health. Even if you get the flu shot, you can't expect it to protect you if you don't take the steps to protect yourself by eating healthier and living a healthier lifestyle. 𝗣𝗢𝗜𝗡𝗧 𝟳𝗮 [𝗧𝗛𝗘 𝗗𝗥𝗨𝗚 𝗣𝗥𝗢𝗕𝗟𝗘𝗠 𝗜𝗡 𝗔𝗠𝗘𝗥𝗜𝗖𝗔]: This probably should be POINT #1. I've discussed this issue for years, but, most people have ignored this problem because they don't see it as a big problem. Of course, that changes after you develop a disease like diabetes and realize years later that the drugs don't really work. When most people see the words "Drug Problem in America", they envision a problem with cocaine, heroin, and other street drugs. However, the Number 1 drug problem in America is NOT street drugs -- it's PRESCRIPTION drugs! For example, a couple years ago, in order to increase the pool of people that take prescription drugs for high blood pressure and high cholesterol, the pharmaceutical industry partnered with the medical industry, which lowered their medical diagnosis targets on high blood pressure and high cholesterol under the guise of helping patients obtain an earlier diagnosis. This "help" increased the potential customer base for new prescription drugs by more than 37 million people! "𝗧𝗵𝗼𝘀𝗲 𝘄𝗵𝗼 𝗶𝗴𝗻𝗼𝗿𝗲 𝗵𝗶𝘀𝘁𝗼𝗿𝘆 𝗮𝗿𝗲 𝗱𝗼𝗼𝗺𝗲𝗱 𝘁𝗼 𝗿𝗲𝗽𝗲𝗮𝘁 𝗶𝘁." If you find yourself struggling with what's the real truth behind all of these drug controversies and what to do, instead of arguing about it, there are 4 ways to figure out the truth: (1) See if there's a money trail; (2) Do the research; (3) Educate yourself about the science and disease pathology; and, (4) Design a science-based non-drug, alternative solution for your health problem. Some people will do the first one, because it's not that difficult. Some people will do the research because they want to know more than just the money-side of the issue. Unfortunately, this is where most people stop. Not because they don't want to know more, but, because it takes a lot of work and time to understand and learn how science really works. And, then, it takes even more work and time to use that science to go the extra mile and design a bottoms-up, science-based, results-driven alternative solution. Science is not for everyone :-)And, the pharmaceutical companies know that. And, Big Pharma knows that people like to complain, point fingers and blame others. It's to their benefit because it keeps people divided while they rake in the big money. And, other people blame science. Science is not the problem! It's the people in powerful positions who manipulate the science and the statistics to protect their multi-billion dollar business, e.g. Big Pharma, FDA, CDC, AMA, lawmakers, etc. People think this is a moral issue. It's not. People think this is a medical issue. It's not. It's business. And, until we begin to realize that it's business, we will continue to argue among ourselves and blame the wrong people while Big Pharma gets more and more powerful. 𝗣𝗢𝗜𝗡𝗧 𝟴𝗯 [𝗕𝗜𝗚 𝗣𝗛𝗔𝗥𝗠𝗔 & 𝗕𝗜𝗚 𝗠𝗢𝗡𝗘𝗬]: The prescription drug business, which includes vaccines, is a multi-billion dollar industry. Getting angry and upset about this won't help you with your diabetes or other health problems. Instead of getting angry, get smarter and eat healthier, and avoid becoming a victim of the prescription drug business. And, do not underestimate the pharmaceutical companies -- they are always one or two steps ahead of us. They along with the CDC have paid TV networks/media to advertise their products and paid off government officials to get laws passed that would eventually make most vaccines mandatory by law to further increase their revenues and profits! Concerning the flu vaccine, although Big Pharma has tried :-), there are no current state or federal laws making the flu vaccine mandatory. However, Big Pharma has gotten around this by using the CDC and insurance companies to convince health-related employers and companies to require that their employees get vaccinated. It's their first step towards getting this vaccine made mandatory. After my recovery, I remember when churches and other community groups would ask me to speak, some reps from various health organizations labeled me as "anti-drug". I quickly corrected them and changed the narrative. Why? Because when you're labeled as anti-something, there is a natural inclination for people to want to argue with you. I changed my narrative to being "the ex-diabetic engineer who can help diabetics", not "the guy who hates drugs." In fact, if you google part of that phrase ("ex-diabetic engineer"), my name will come up on the first page of Google. Pretty cool, right? At a local health fair where I was asked to speak, a doctor stood up and accused me of being anti-drug. Instead of arguing with him (and realizing that most of my audience took drugs), I said: "Actually, drugs saved my life. I love drugs." :-) The doctor was so shocked by my response, he didn't know what to say, so he sat down. Then, I said: "Although the drugs saved my life, I realized that if I continued to take the drugs over a long period of time, that my body would deteriorate and would become dependent on the drugs." Then, I said: "So, if it's okay with everyone, I would like to discuss how you can live a healthier life. How does that sound?" The place went nuts -- there was a loud uproar of amens and hallelujahs. Even the doctor shook his head in agreement. (1) Big Pharma WANTS you to argue among yourselves -- that's how they stay in control! Maybe it's naive on my part, but, instead of two groups fighting each other, the groups should combine towards a common goal to have "safer, more effective vaccines and no more unsafe vaccines" as the goal. How about a "safe vaccines" group or organization? Big Pharma knows this is the only way that they could lose control -- is for the masses to unite against them instead of against each other. Similarly, vaccines also cause side effects and weaken your immune system. Initially, some of our students and clients didn't believe this because they didn't experience any side effects when they got the flu shot. But, lately, some of them have had some serious adverse reactions to getting the flu shot. 𝗣𝗢𝗜𝗡𝗧 𝟭𝟬𝗮 [𝗡𝗔𝗧𝗨𝗥𝗔𝗟 𝗥𝗘𝗠𝗘𝗗𝗜𝗘𝗦]: Knowledge is power. Information is power -- but only if people have the right information. 𝗣𝗢𝗜𝗡𝗧 𝟭𝟬𝗯 [𝗡𝗔𝗧𝗨𝗥𝗔𝗟 𝗥𝗘𝗠𝗘𝗗𝗜𝗘𝗦]: First of all, when it comes to fighting the flu, the problem is not the pathogen itself -- it is the terrain in which those pathogens interact. If your body is strong, then, it can defend itself against most pathogens. In other words, if you have a healthy and strong immune system, it can defend your body against the flu virus. But, if you are not healthy, your weak immune system will not be able to defend your body against the flu virus. I sincerely believe that if you do your homework (research), you will BE PREPARED and you will be healthy. If you don't do your homework, you will not be prepared and you will not be healthy -- it's that simple. 𝗔𝘂𝘁𝗵𝗼𝗿 𝗦𝗶𝗱𝗲𝗯𝗮𝗿 𝟭: I don't necessarily agree with all of the information on some of the websites referenced in this post. In addition, some of these websites may manipulate the data or the facts. That is why I always go back to the science. I have found that the more I understand about the science, the easier it is to understand the controversial issues with diabetes, nutrition, prescription drugs, vaccines, and other health issues. The drug companies have assumed that since most people are not scientists, that they can trick or intimidate us (with fear tactics) into making poor health decisions. Unfortunately, those poor decisions end up damaging our health while making money for the drug companies. In addition, the drug companies are very good at manipulating opposing groups to argue among themselves instead of uniting against the drug companies.